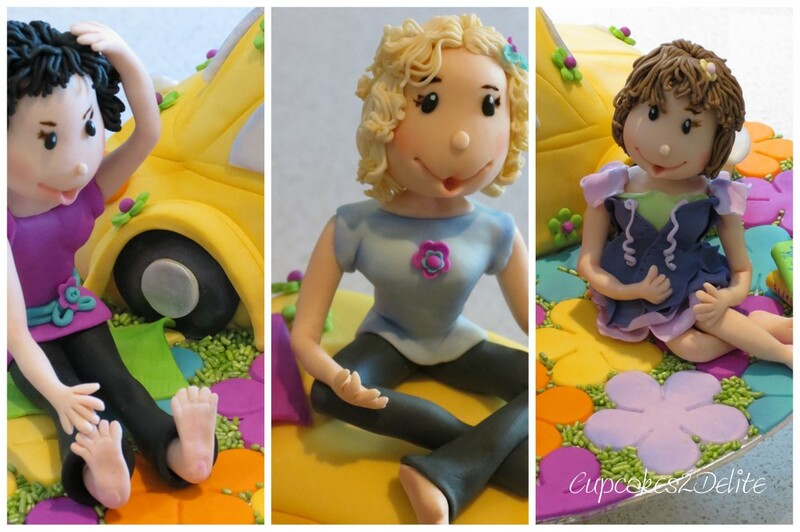 Volkswagen Beetle Birthday Cake for 3 Friends! With 3 birthdays closely following each other, Shaunagh came up with the idea to host the party for these 3 of our scrapbooking friends at her home. Not only did Shaunagh treat us to a delicious and beautifully served lunch but we had fun party entertainment provided by Lisa (TQO), an abundance of presents to be opened by the 3 birthday girls, loads of laughter and chatter, a grand meeting of Kaiser, Shaunagh’s infamous dog, and of course a cake to celebrate Lisa (TQO), Lisa, our teacher, and Tracy’s birthday. 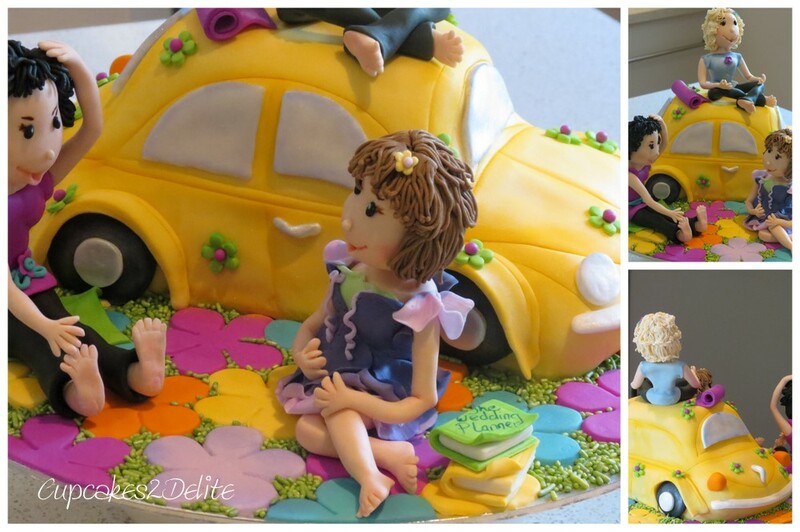 Instead of a cake each I designed a combination cake for them with a bright yellow VW beetle as the backdrop to the 3 figurines. My son was so helpful in helping me get the character of the VW right, so thanks Teigh, you always have the time to offer me advice in all my designs! Lisa, our scrapbooking teacher, is the figurine sitting sweetly meditating in a comfortable yoga pose on top of the beetle. She is smiling serenely as she loves her yoga and pilates and knows she looks totally gorgeous with her beautiful soft blonde curls. Lisa (TQO) is the figurine with the fun, cheeky face and short funky black hair who is trying to remain sensible looking while touching her toes. This figurine is as mischievous as Lisa is in real life because she started off in a ‘downward dog ‘ pose but when her head fell off I changed her into a sitting pilates pose! Tracy of course is completely well behaved and I depicted her as a Lysianthus wedding planner fairy complete with her wedding planning books as she has had the most exciting year with both her daughter and son getting married within months of each other. She looks as pretty in her little purple dress as Tracy looked in both sets of wedding photos. Just loved celebrating with these 3 special women on my life and delighted you loved your individual figurines girl! ← Up Up … and Away! Thanks Wendy, 3 very colourful friends inspired this cake! Thanks Michelle, aren’t we just so lucky to have such good friends to laugh with and yes “poor” Angela missing out! Glad though we had her exciting trip news to catch up on after all the exciting of the party!